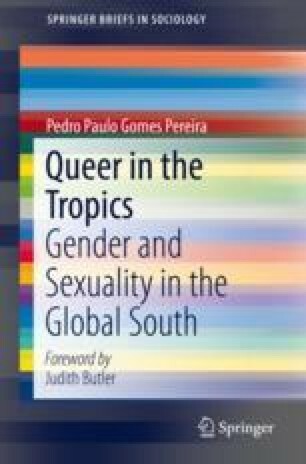 This Chapter examines the pressure that conservative sectors in Brazil continue to exercise against progress made in the fields of gender and sexuality. It also comments on the violence of these groups’ protests and rallies. Based on research experiences, the article calls the opposition between religion and alternative forms of sexuality and gender into check. Considering Judith Butler’s theories, the work examines possible openings, as well as the possibilities of mediation, and the limits of thinking in accordance with fixed categories. It also signals that the best path for considering these questions may be by drawing closer to the multiplicity of agents and their unprecedented forms of agencies, as well as the creativity of their poetics when associated with religion. Furthermore, the work defends the necessity of bending agency, including bending Butler’s own theories. Butler, J. (2017). O Fantasma do Gênero. Folha de S. Paulo, 19 Nov 2017. [Online]. Available at: http://www1.folha.uol.com.br/ilustrissima/2017/11/1936103-judith-butler-escreve-sobre-o-fantasma-do-genero-e-o-ataque-sofrido-no-brasil.shtml. Accessed 22 June 2018. Peixoto, C.E. (2009). Documentário Gisèle Omindarewa. 65 min. [Online]. Available at: http://oriose.blogspot.com/2013/08/documentario-gisele-omindarewa.html#.W2RcxNVKiUk. Accessed 28 June 2018.